I could have went to Tim Horton’s this morning. I could have ordered a breakfast bagel and a double cream large Dark Roast. Yeah, I could have done that. Hell, I could have went through the drive through. Wait, there’s also Rotten Ronnie’s as an option, they have great coffee. 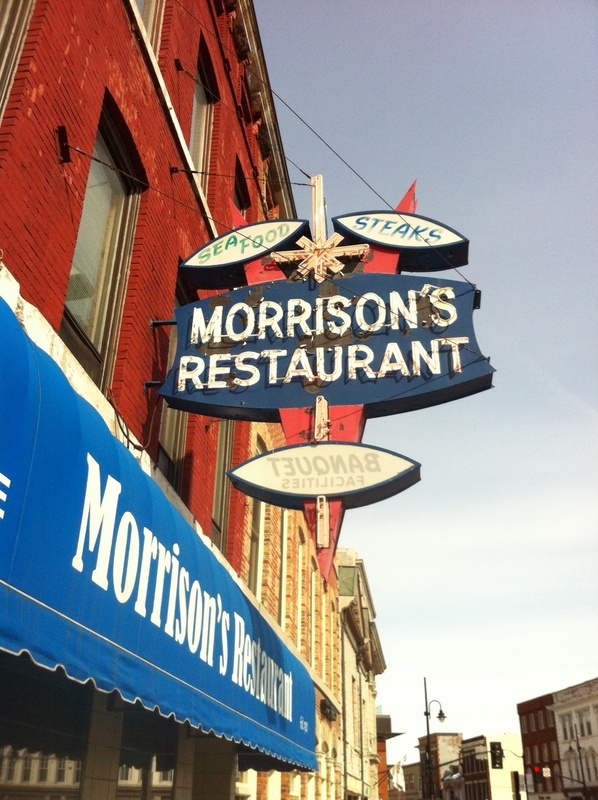 I went to Morrison’s Restaurant. That unassuming nook across from Market Square with the flashing sign reading Sea Food and Steaks. A place where Nutritional Information need not apply. This is the place that could have been up the road from that nuclear bomb shelter, Ford Fairlane parked out front, a couple of “Hoods’ leaning against the car making plans that end in Daddy -O listening to a radio warning of a Cuban Missile crisis. It’s not. It’s in Kingston. Downtown. Today. The old lady in the white T-Shirt wrote it down. She wrote it down? Yeah, that’s exactly what she did. She didn’t have to. Everybody orders that. I swear it was five minutes later when she came back. The breakfast came with home fries. Not the frozen McCain’s crap. This was the real thing that resembled quasi mashed potatoes. I sat there and savoured the bacon bliss. Inhaled it before my fork sliced through the cholesterol carnage. Then I sipped the coffee. No flavoured wussy latte stuff. This could have stripped the paint off of that Fairlane. I thought about putting ketchup on my eggs. It was tempting but I wanted it straight up, no frills, just a slathering of salt and pepper. Ok, a lot. My world is all black and white today. Salt and pepper. Today, I’m getting my news from the Globe and Mail print edition. When the news was as current as yesterday. For a moment, that coffee tasted sweeter than my wife’s kisses. The toast? Wonder Bread. Nothing from Texas style. it was either white or brown. She put butter on it. Not margarine. Butter tastes great! Sitting there staring at the empty plate waiting for the bill to come, I thought about those mornings when my grandmother would make me bacon and eggs. The sun shining through the kitchen window, the dog licking up a fallen piece of bacon and the smell of Maxwell House instant coffee. Yeah, those were the best days of my life. Then I think about my wife’s kisses this morning. I think about our son’s wave and smile as he crosses the gate leading into the school yard, ”Bye, Daddy! No, the best is yet to come. I asked the old lady what kind of coffee it was. This week’s #Happy Act is to go get a Two Egg Special and savour more than just the meal. Mark is a dad, husband, screenwriter, brew master and die hard Cubs fan who was recently named the “Unofficial” blogger for the Chicago Cubs in Canada. You can check out his blog or follow him on Twitter @canuckcubbie. Mark: My Mom worked as a waitress at Morrison’s many, many years ago. It is truly at Kingston landmark. That’s so cool you have a personal connection Rhonda. Great post, Mark, thanks for sharing! I think what is amazing about it is that time warp when you go in. Everything feels simpler, even the eggs. Great job Mark! Keep up the good work. A very enjoyable read. Hi it’s me, I am also visiting this website on a regular basis, this site is really pleasant and the people are actually sharing good thoughts. You’re so cool! I do not suppose I have read a single thing like that before. It is really a nice and useful piece of information. I am glad that you simply shared this helpful information with us. no means understand. It seems too complicated and very broad for me.